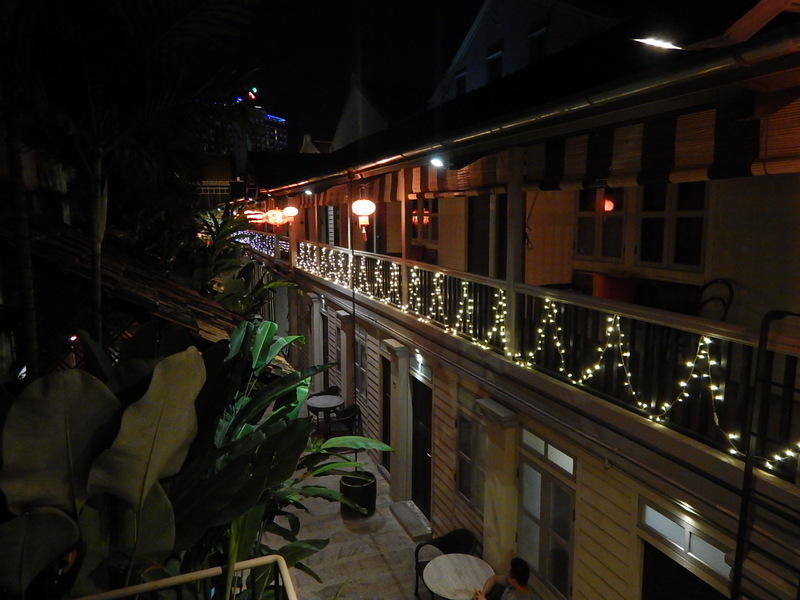 Our Mews hotel at night. Our final stop in Malaysia was George Town on the island of Penang, the journey from Tanah Rata to George Town took us down the mountains and joined the main road running up the west coast, we crossed to the island over a bridge stretching over 13km and drove into the city. 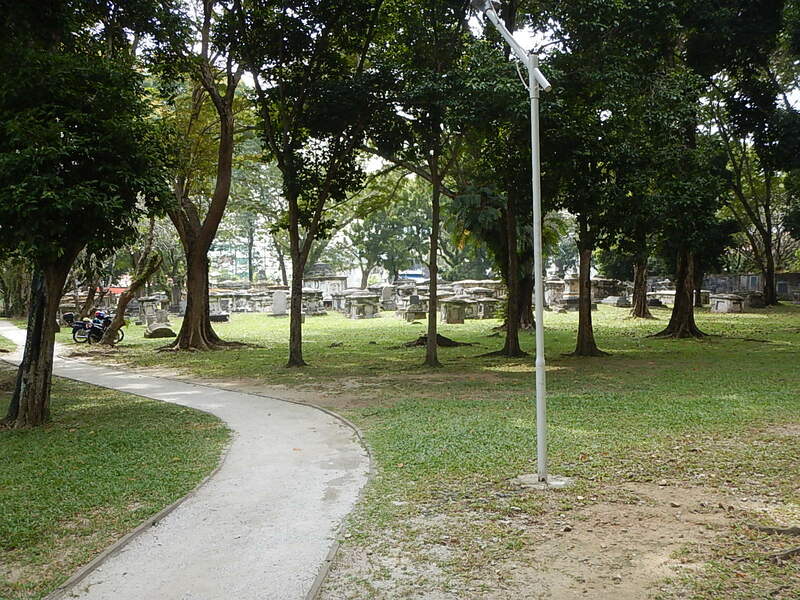 George Town is a prosperous modern city with a flourishing tourist trade and a lot of high end apartments for foreigners who spend six months a year there. At the heart of the city is a UNESCO World heritage site covering the old town created by periods of, Portuguese, Dutch and English rule and extensive trading links with India and China; the old city blends buildings, cultures, religions and cuisines from all of these to create a wonderful vibrant town. We were staying at Muntri Mews, an old mews stable block which had housed the horses and carriages of the wealthy families living in townhouses in Muntri Street. The hotel had about 12 rooms arranged on two levels along one side of a courtyard, our room was upstairs, it was quite big with a sitting room area at one end, a bathroom in the middle and a bedroom area at the other end which was dominated by the biggest bed we had ever seen, it stretched from wall to wall and must have been 10 foot across. 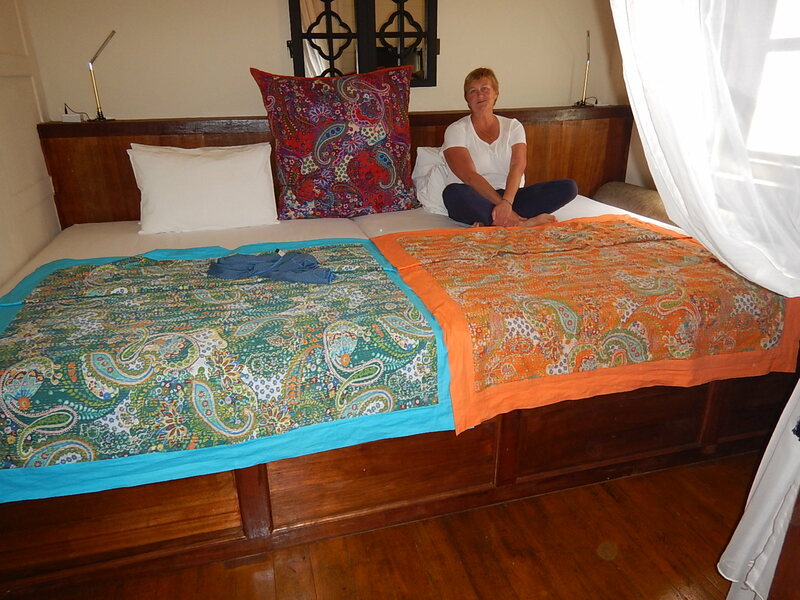 Sadly, the top sheet was only about 8 foot wide! Room for a small one? After we arrived we went out for a walk around the local area to get our bearings and find a cash machine. That evening we had arranged to meet Sandra and Phil, an English couple on a trip similar to ours; they are travelling with the same travel agent, our contact at Audley realised we would be in Penang at the same time and put us in touch with each other. We met for a drink in the hotel bar where we enjoyed sharing tales from our travels, and then decided to have dinner together, we headed to a Chinese restaurant both Sandra and I had read about, it was shut, our taxi driver recommended another restaurant which was fully booked, in the end we decided to try the Red Garden hawker centre near the hotel. Hawker Centres are covered dining areas served by lots of food stalls offering all kinds of different food, they aren’t glamorous but they have a good reputation in Penang. Most of the tables had reserved signs on them which was odd, it’s not the kind of place you book, it turned out they had been reserved by waiters who make their money by selling beer, as soon as we agreed to buy four bottles of local beer a table miraculously became available. Mark and Phil decided they would ‘guard’ the table (and the beer) and sent Sandra and I off to find some food, nearby we found the Claypot Frog Porridge stall but decided against that. We ordered some Dim Sum (Chinese dumplings) from one stall to start with, we ordered by pointing at pictures and samples on display and gave the stall holder our table number, ten minutes later the freshly cooked food arrived and we paid for it from the table. After the dim sum we had Malaysian satay, grilled prawns and a selection of Japanese tapas style dishes. It was a brilliant evening, the food was good, the beer flowed, the band and singers performed greatest hits from dodgy wedding receptions (I will Survive, Roll out the Barrel, and a selection of Adele and Abba hits) and it was incredibly cheap. The next day Mark and I were booked on a walking tour in the National Park to the north of George Town. We were picked up by a guide called Scott at 08.00 and drove for about 45 minutes to an entrance on the other side of the park where we signed in. We boarded a small fishing boat which took us out through the estuary to the sea then along the coast of the park, we saw lots of mud skippers, wading birds and White Bellied Sea Eagles. The boat set us down on a perfect white sand beach at the back of which sat a turtle hatchery which protects turtles and the eggs they lay on the beach all year round. After looking around the hatchery we set of into the jungle behind the beach gradually climbing up a hill in the centre of the park, it was a hot day and we were very glad of the shade and the bottled water Scott was carrying. A couple of hours into the walk we came to a stream tumbling across a series of large rocks creating pools and little rapids; we found seats on the rocks and Scott produced a simple picnic of bananas and chocolate bars. I took my hiking boots off and soaked my feet in the stream while we ate. After lunch the walk got steeper, we followed the track up hill, climbed rough steps and clambered over the roots of trees along the side of the path. All through the walk Scott showed us plants he had learned about during a very traditional childhood living with his grandparents in a communal long house in Borneo. He showed us leaves that can clean wounds and staunch bleeding, others that provided Malaysian rebels with protection against Malaria and dehydration, we saw herbs and roots used in cooking. Finally, after 3 ½ hours walking we reached the top of the hill and started our descent to the other entrance of the park; the way down was almost as challenging as the climb but it was exhilarating to travel through the forest with such a knowledgeable guide. We were very glad to reach the end of the trek and find the path back to the park entrance where our driver was waiting for us with bottles of water and air conditioning. Just before we reached the carpark we were lucky enough to spot a large monitor lizard on the beach alongside the path, we watched it for several minutes, it was about five-foot-long and its head must have been 2 foot off the ground. Another great adventure. 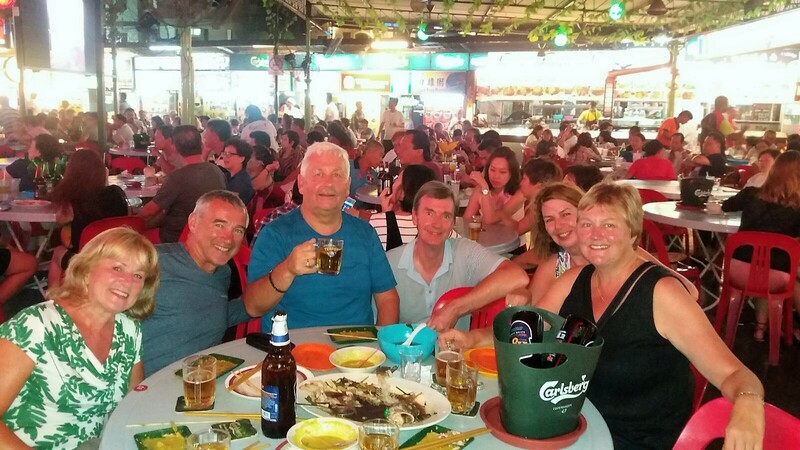 That night we joined up with Sandra and Phil again and with James and Nina, another couple travelling with Audley on a three-week tour of Malaysia shadowing Sandra and Phil’s itinerary, we had another great evening at the Red Garden Hawker Centre. On Wednesday we were collected from the hotel at 09.00 by Philip, a retired history teacher who was our guide for a morning guided walking tour of the old town. Philip led us through china town and little India, he showed us historic buildings, clan houses and temples. He told us about the history of George Town and took us to Armenian Street which has been used as a location for the TV series Indian Summer which was filmed around Penang. Philip was born in George Town and some of his stories about growing up in the streets we were walking provided real colour to the walk. We reached one street lined with souvenir shops and cafés, Philip wanted us to see a mural on a wall at the far end of the street, he told us where to find it but said he would wait on the corner for us. When we got back he explained that because he was born nearby all the shop keepers know him and if he is seen leading tourists down the street they give him a hard time for not taking them into their shops! We had a free afternoon so we took the chance to do some laundry at the laundrette across the road then met up with Sandra and Phil again for another meal out on their last evening in George Town. This time we went to a restaurant in Chinatown, our first choice was very busy so we went to another one around the corner, we found a table on the pavement outside a very simple restaurant with about eight tables in a white tiled room open to the road with a small kitchen at the back. The owner welcomed us and asked us what we wanted to eat, we asked to see a menu and were told there wasn’t one. In the end, we followed his suggestion of half a dozen dishes which quickly arrived from the kitchen; sour fish, pork in black sauce, chicken with ginger, broccoli with garlic, spicy prawns and white rice. It all arrived on brightly coloured plastic plates and tasted great. Part way through the meal I bent down to my handbag and came eye to eye with a small rat by the wall, it turned around and headed away, I decided not to mention it to the others until we left the restaurant, when I told them about it they all agreed I had done the right thing. We spent our last day in George Town resting after some tiring walking the previous two days. We visited the historic protestant cemetery which is recommended for the insight it provides to the fate of early English settlers. We walked along the seafront passed the historic Eastern and Orient Hotel and had dinner in our hotel restaurant. After four nights at Muntri Mews it was time to head to Penang Airport for a flight to KL and a connection on to Colombo in Sri Lanka.